Melbourne Cup early betting, final field, barrier draw, results & dividends. Free Melbourne Cup preview & tips, bet on the Melbourne Cup online. Free online racing form guide for the Melbourne Cup. Spring Racing Carnival Jockey Challenge Betting, Australian jockey profiles & Australian horse racing trainer profiles. How to bet on the Melbourne Cup, bet types explained, bet small and win big. Sign up for the free weekly newsletter. Open an online betting account and get exclusive bonus bets. Racetrack Guides to Flemington, Caulfield, Moonee Valley, Sandown, Rosehill, Randwick, Doomben, Eagle Farm, Morphettville, Gold Coast, Ascot, New Zealand and country racetracks. Track Bias indicators at all Australian city horse racing tracks. Australian horse racing racecourse maps. Watch live racing online from TVN. Listen to live racing radio online. Calendar for Australian Group One & Feature Races. Melbourne Spring Racing Carnival results & dividends. 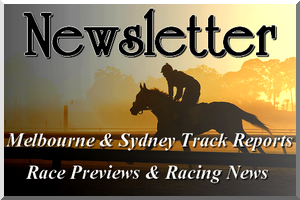 ARR email newsletter updates include weekend race previews every Friday, exclusive betting offers and special editions for special races such as the Melbourne Cup. OUR PROMISE: we will never share your email address with anyone, and we'll only ever contact you about Australian racing. Missed the deadline? No worries! Follow us on Twitter (@TrackReport) to get regular updates to track conditions in Melbourne & Sydney and to read our newsletter online.